Home » Technology » When was the 1st WheelChair Introduced ? When was the 1st WheelChair Introduced ? The paralympics of 2012 have shown the world that less-abled Olympians can compete and perform every bit as well as their Olympic counterparts. The technology of the various prosthesis and wheel chairs are amazing too. But when was the first wheelchair as we know it invented ? The answer to this question is not easy and cannot be said to be definitive so when the best we can say is, “perhaps in ancient China, though you’ll find examples of disabled individuals being moved around on wheeled furniture in almost any place and era”. Some people were wheeled around because they were too lazy, rich or important to walk! One of the best-documented examples is Philip II of Spain (1527-98), who used a custom-built chair in later life when suffering from gout. If you were infirm or disabled, your mobility depended on family or servants, or your inventiveness, as in the case of Stephan Farfler, a German watchmaker who built himself a hand-cranked tricycle in the mid-1700s. In Britain, wheelchairs were being made to various designs by the 18th century. Belgium-born inventor John Joseph Merlin (1735-1803) created one prototype, though he was more famous for designing the roller-skates he demonstrated by skating into a party, and smashing into a mirror. the Bath chair, invented in Bath to take invalids to the spa waters. Britain was also home of the Bath chair, invented in Bath as an improvement on sedan chairs, to take invalids to the spa waters. The Bath chair design soon became a popular method of mobility. 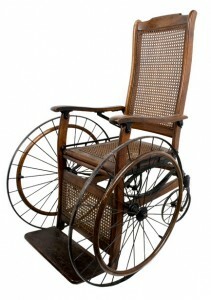 Recognisably modern designs with wheels, in which users could propel themselves, appeared in the late 19th century. The American Civil War and the later world wars all served as spurs to invention; powered chairs appeared in Britain as early as 1916. The most commercially successful chair is the lightweight folding chair, which American engineer Herbert Everest designed in the 1930s after he broke his back in a mining accident.